This chapter seeks to establish the current knowledge on energy efficiency of cable shovel operations. 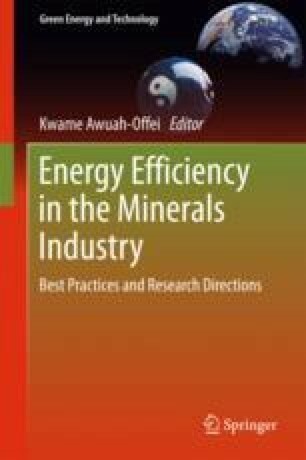 Additionally, the chapter uses a review of the literature to make recommendations for industrial best practices and for future research to address identified gaps in the literature. The chapter first presents the fundamentals of cable shovel operations and the factors that affect the energy efficiency of shovel operations. Subsequently, the chapter presents an overview of the latest research on cable shovel energy efficiency, which is used as the basis for the recommendations. The chapter recommends that industry practitioners should use the right drive systems for their cable shovels, use data analytics to understand shovel energy efficiency, and carefully evaluate the costs and benefits of energy efficiency initiatives. The chapter also recommends that future research on shovel energy efficiency should: (i) establish theoretical benchmarks for cable shovel operations; (ii) account for human factors in the design of operator guidance systems to assist operators during shovel operations; and (iii) evaluate how effective operator training programs are in improving shovel energy efficiency. The author is grateful to Dr. Nuray Demirel who reviewed the original manuscript and made valuable suggestions that improved this manuscript tremendously.